Willett lovers should plan to flock to Lexington later this month for a dinner at the 21c Museum Hotel restaurant Lockbox. Next Thursday September 20th, the for a three course whiskey dinner featuring a flight, cocktails, and some damn good food. This event is part of the Fork & Bottle series, which features beverages alongside the hotel’s culinary talents. They’ve done wine and beer in the past, and it’s an obvious pick to do whiskey during Bourbon Heritage Month. Sorry Louisville and Cincinnati folks. The post Like Willett and Food? 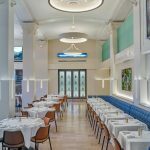 You Should Snag Tickets to This 21c Hotel Dinner at Lockbox appeared first on The Bourbon Review.